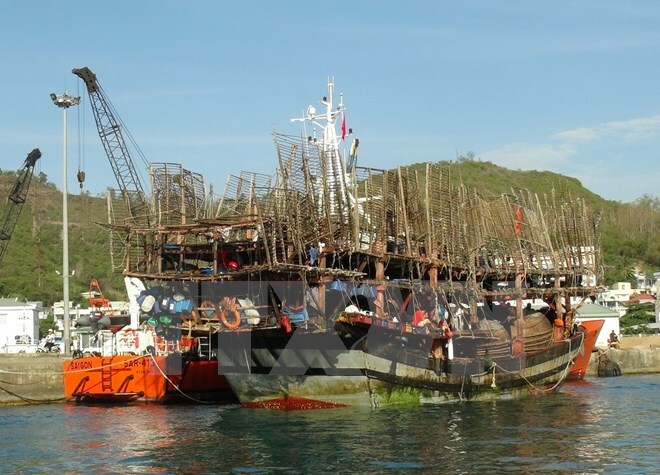 KHANH HOA — The Viet Nam Maritime Search and Rescue Coordination Centre's (Viet Nam MRCC) SAR 413 boat today towed a troubled trawler to Nha Trang Port in the central Khanh Hoa Province. The captain of the QNa 90956-TS trawler was Ho Tuan Kha, a resident of Nui Thanh District's Tam Hai Commune in the central Quang Nam Province. The trawler had 38 sailors on board. Engine failure had forced the trawler to go adrift in the waters off the Truong Sa (Spratly) Archipelago, following bad weather. On receiving the news, the Viet Nam MRCC dispatched the SAR 413 boat to rescue the trawler and its men. It reached the troubled trawler on Saturday morning. The rescue boat personnel provided medical aid to the fishermen who were exhausted and in panic after facing strong waves and winds, and safely towed the trawler to shore.